I received the book - thank you! Since I plan to give it to myself as a christmas present I just took a fast glance to see that everything is OK and I love it, the print and the images are of very high quality and the best I have seen anywhere before. I'm already am looking forward "reading" it during christmas holidays. Very nice book with the usual high standard of the profiles. Some new profiles I have not seen before. Good job Claes! Keep up the good work! The book arrived today, and what a fantastic book it is! Excellent work on the profiles Sir. I am really looking forward to your upcoming series. Thanks again for the quick delivery and your wonderful work. I have just received your book and I really appreciate it. Perhaps I'm not agree on the color issue on some of the profiles included but that is the common issue with old blurry B/W photos. One bonus is all the profiles of machines I heaven´t seen before. The book arrived and I am very very glad and proud to hold it in my hands! It's beautiful perfect to me. I took a first look and it surpassed my expectations. Truly beautiful profiles, full of detail, which make the aircraft almost come alive. Too bad there are only 124 of them... ;-). And a little pity of the misplaced texts in profile numbers 120 and 121. I'm looking forward to your upcoming profile book series as described at the end of this book. Copy-No. 187 is arrived today. After looking the first pages I have to say, that I find the high-class profiles perfect. I'm looking forward to the new series and beg you for information when the books are edited. I've just received the book and can only say that I am atonished with the quality you have reached in the artistic skill, and with the printing of the plates. Congratulations!! This is a piece of gorgeous work and to be continued in the next volumes in any case! Just carry on. I like the book very, very much. It is an art book for sure. I am very happy that you have added new profiles of Ju-88s and Bf 110s. I also noticed that there are 4 new books coming up. The book is great and for sure your profiles are the high end what is possible in profile artwork. I think I have to rework mine. Yours really look mate and not glossy. Very realistic! I've just received your great book-LUFTWAFFE FIGHTER AIRCRAFT 124 AIRCRAFT PROFILES. I enjoy it very much. I like it. Thank you again for your kind action. It is wonderful. i also have your 2 previous profile book and i really like the larger profile layout. looking forward to your next releases. The book is superb: a lot of trilling stuff and with details I've never seen before. Great that you singed my copy. It was also nice with that short graphic presentation of how you make your profiles. I will continue to enjoy your profiles and dream about which one I have to build. I'm also looking forward to your upcoming titles. Thank you very much for this excellent piece of work. I'm looking forward to your new books with even more profiles. My first impression is very positive, absolutely a great improve on the quality of the paper and of the print, a really fantastic work. You have done a terrific job, the profile look so real!! I am looking forward to your next publication, and good luck with your own publishing company. I am finding the profiles fascinating and am changing my mind, as I go through the profiles, as to which aircraft I am going to build. The prints are excellent. I am looking forward very much to your next books. Just to say I received the book and it was just as good as I expected! Superb work my friend, and what a great surprise at the back of the book to discover more are on the way! The book is absolutely splendid! I am as much impressed as when I have discovered, many years ago, your profiles in Schiffer! Thank you so much for your stunning work! I do really like this book. More, I'm pleased to know that you're going to publish several more titles in the near future! Please, let me know as soon as you have release dates. Keep giving us such beautiful pieces of art! Completely awesome!...just got the book today! I will get the others too when they come out. Please keep me posted! Nice book and great profiles. Looking forward to your new profile-books as announced in this book. Please keep me informed. Thanks for making this signed and numbered publication available to me! One word comes to mind, Bravo! The wait was worth it, WOW! I have both of your other Profile books and this one most certainly raises the bar, superb artwork from start to finish. Look forward to more in the future, well done Claes! just received my book (n°56) and it is absolutely splendid! I am as much impressed as when I have discovered, many years ago, your profiles in Schiffer! Thank you so much for your stunning work, Cheers! Just received my copy of Luftwaffe Fighter Aircraft number 167. What a fantastic collection of profiles! I have several books with Claes' outstanding work and this ranks right up there! A must have for any Luftwaffe or aviation collector who appreciates great artwork! I look forward to adding all of the upcoming books by Claes to my collection! Ten minutes ago I've recived my book (numbered 102) and it's fantastic! In spite of the fact that there repeat themselves several planes of other books, I see that they are not the same profiles. Already I wait longingly for the 4 new books. Thank you again. Bonjour. I receive the book this week and it is really great. Fantastique work as usual !. I prefer when their is more explanation like you have done in previous publications even if I understand this is a limited edition only for the "profiles". I am waiting the other upcoming books with "impatience". 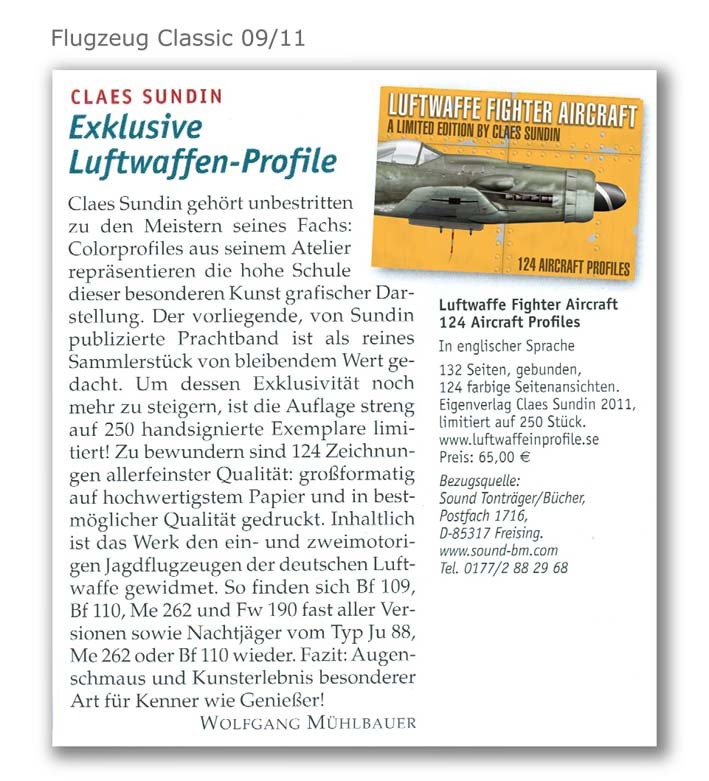 When do you plan to edit the Luftwaffe Fighter Aircraft Profile Book N°1, N°2, etc ?. I can see profile 110 of Willi Reschke has some small differences compare to the one in previous publication in 1997 page 125, profile N°115 in color (more grey) and home defense band (thin Greyblue horizontal bar). One remark only, I don't like so much even if it is Pictures or Profiles to have big one across the two pages open like for Profiles 6, 41, 110, 119, 124. For me, we loose a lot even if more details because of the scale. Regards. Hello from Tammerfors! In my opinion new one is your best so far. I have all of your`s books and I`d check them out. Big size profiles compares favorably the older ones. Very nice coloring, just like I`always have thought. RLM 76/75/74 is triple grey and it`s not green or purple. In future if I may wish, please. 1. Hardcover because I read books over and over again. 2. I`d like to read what pilot did with that machine. If there must be any writing at all? I´ll look forward to your four other books. Best wishes! Claes you are a genius. I have my book and I love it, outstanding work! You are an inspiration, love it, love it , love it. We need a large 109 in the next print. Once again thank you! Kind regards! My son Michael is hoding the book, showing one of five "centerfolds" this time a Ju 88 C-6 flown by Wilhelm Beier 10./NJG 1.